Although sparkling icewines have been made in Canada since the late 1990's, they are still a rarity. I only first heard about them this past Spring while researching this article (in Dutch) I wrote on ice wines in general. Because of their high sugar levels, Canadian icewines were forbidden in Europe until 2001. The concern was that a second fermentation could occur in the bottle. As was the case with the monk Dom Pérignon, the resulting sparkling wine would be seen as a fault, a hazard which could break the bottles. But refermentation is precisely what Canadian icewine producers like Inniskillin are doing now, only the second fermentation takes place not in the bottle, but in a steel tank (Méthode Cuvée Close). In reality, it is difficult to ferment ice wine grapes because of their high sugar content; inducing a second fermentation is even more difficult. Vinification lasts seven months and the wine is aged on the lees, then filtered and bottled under pressure. The idea of combining bubbles with the delectable sweetness of icewine seemed like a double decadence to me: I simply had to try this! A recent trip back to Montreal provided me with an opportunity. I scoured the government-owned liquor shops in la belle ville, searching but came up empty. Extremely rare, I was told. 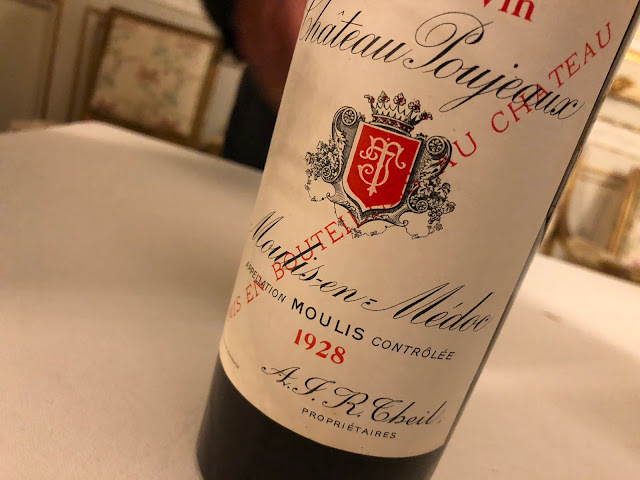 One shopkeeper remembered a half-bottle retailing for $160. It didn't sell very well. Icewines there were aplenty, and also the latest kick, ice cider (not bad, really), but no sparkling icewine. Dejected, I boarded the plane to go back to Amsterdam, and while killing some time in Heathrow at the duty-free, I saw a golden bottle gleam on the shelf: Inniskillin Sparkling Icewine 2006 (375 ml), £40 for purchase within the EU. That translates into €46 these days! The grape variety is 100% Vidal, a hybrid made from Ugni blanc and Seyval blanc. It is a popular variety for icewine in Canada because its thick skin allows it to survive the early frosts; in fact, grapes are usually harvested in January. Golden in the glass, its effervescent bouquet made me think of apple cider, with a hint of apricot. Thick in the mouth, decadently sweet and instantly lively with bubbles and excellent acidity revealing tangy peach and apricot flavours with a long-lasting honey sweetness. 11.5% alc. 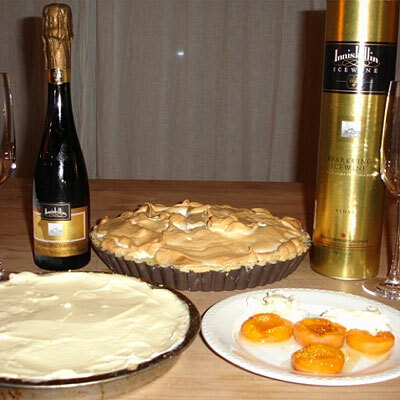 Icewines of course are dessert wines, but which dessert passes best by a sparkling icewine? A general rule is never serve a dessert which is sweeter than the icewine itself; this will detract sweetness from the wine and instead pronounce acidity. So I decided to prepare three different desserts for my sparkling icewine. I've probably gained a kilo writing this piece. Fresh apricots caramelised in maple syrup with half-melted gorgonzola and mascarpone: this simple dish (with a long name) worked by far the best. The apricot flavours in the food and wine enhanced each other, resulting in sweet, powerful fruit, counterbalanced by the gorgonzola mascarpone. Excellent. Cheesecake: not as nice. Something sour comes out, some of the sweetness is lost, noticed immediately upon mouth contact. Doesn’t work. Lemon meringue pie: worst choice by far. The citrus flavours tend to give the wine an almost rhubarb-like acidity. Of course, you could also choose to skip dessert and just enjoy the wine, which is what I eventually did. Where can you buy sparkling icewine? Various internet wine shops are selling it; whether or not they have it in stock is another question. Google and you shall find. If all else fails, book a ticket to somewhere via Heathrow and hit that duty-free. Liked your blog on Inniskill icewine. You describe it very well and refresh my memory. In the rare occassion you travel to Toronto, hit the road and you will find more than 25 wineries. We visited a few, and Inniskill was good, but Jackson-Triggs was better. I'm glad you enjoyed the piece. It was actually written by myself, not David, but I'll take that as a compliment as I enjoy reading David's postings too.